Collages of iconic inventions which include elements from the patent filing and a photograph of the item on a contextual background. From an early age John had a darkroom and loved using techniques such as dodging and burning, blending etc. When post processing went digital it opened up more possibilities. He started experimenting with blending multiple images and textures together and created a series of fine art photographs. In the pursuit to create textures for blending, a new and unique collection of work was born that tell fascinating stories. John had photographed an old coffee mill and in the base of it was two patent dates. He searched for the patents and decided to integrate some of the elements into the image. 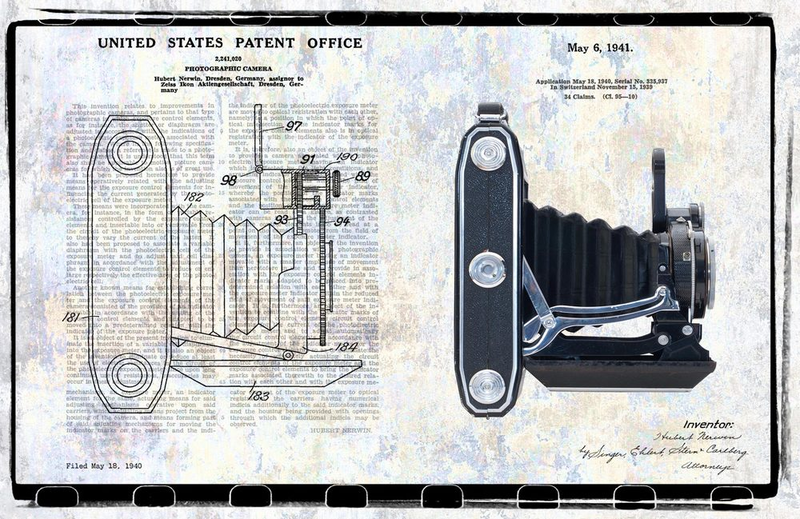 Seeing the legal language and the old patent drawings together with a photograph of the actual invention, he caught a glimpse of how an inventor's dream became a reality and became inspired to create the Patent Artwork series. Joined by his wife, Shantie, meticulous care is taken to match the patent filings with the actual inventions, track down and photograph the pieces, create the contextual backgrounds and putting the final collage together. Each print has an amazing story behind it. These prints make great gifts for anyone with a passion or profession and for decorating any room of the home or office. You can find John and/or Shantie at many Sugarloaf Shows.